I wrote two sequels to Avery McShane shortly after Bloomsbury Children's Books bought the rights to the first book. I plan on releasing this one pretty soon, before folks forget about what happened in the first adventure. A lot of you are probably scratching your head about the title of the book. What the heck is a Tepui? Well, for those who don't know, a Tepui is a huge tabletop mountain, not that different than you might see in Arizona. But they're a lot bigger, taller and, instead of finding them in the desert, you find them in the deep jungles. They're so tall that they often stick up above the clouds. Most of them are in Venezuela. 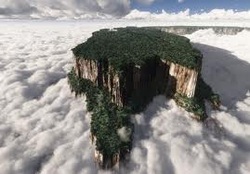 Angel Falls, the highest waterfall in the world, flows right off the top of one of them. Also the flora and fauna on the top of them is completely different than the jungle. The Tepuis inspired the book 'The Lost World' and movie 'Up'. 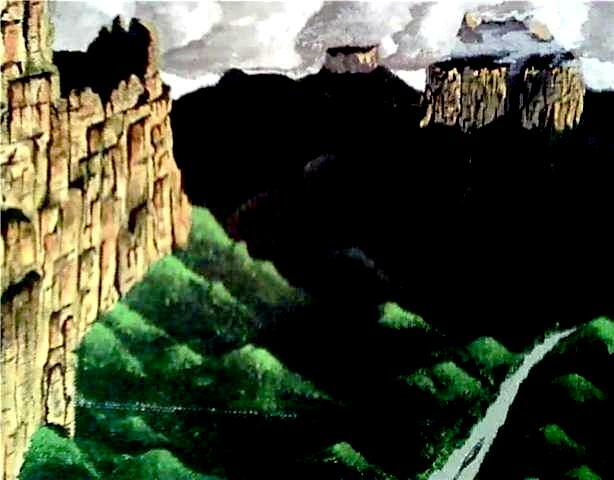 I started an oil painting of the Tepuis a long, long time ago, but I never finished it. It was my first ever effort at oil painting and, like writing books, I'd never ever tried it before. That's a photo of the painting below. Just below it, I included a photo of a real one. Tepuis have always been mysterious and awe-inspiring to me. I thought we were done with Lieutenant Sanchez. He’d been sent to jail in Caracas and they’d thrown away the keys. Things were back to normal here in Campo Mata, in the middle-of-nowhere Venezuela. We were going on a jungle trip with my dad to hunt for diamonds along the banks of the Orinoco River. It was the first time he’d invited us Machacas, which is what Billy, Todd and me called our super exclusive, no-girls-allowed-ever club. Our headquarters were in the middle of the jungle that surrounded our camp, in a tree house high up in the branches of a huge mango tree. So, even though Sanchez had sworn to me that he’d find me one day and kill me for what I’d done to him, I wasn’t worried about it. Maybe I should’ve worried. That’s because we got nabbed by some diamond smugglers while we were on our trip and their leader was none other than Roberto Malo, the twin brother of Pablo Malo. It was Pablo that blew his own head off with his shotgun when he’d meant to blow my head off. To make matters worse, Sanchez had escaped from jail and was on his way to the smugglers’ town where we were being held for ransom. When he got there, he’d be telling Roberto what’d happened to his brother. For sure they’d just strangle us and feed our dead bodies to the piranhas and gators. Good thing we managed to escape before he got there, but things had just started to heat up. Besides, they had shot Mati, my dog. So, of course, that meant war! They came right after us, trailin’ us with their demon dog, Loco. We didn’t have a clue where we were, except in the middle of the deep, dark jungle. We ended up hiding in a cave behind a waterfall, in the cliffs of Lost Tepui. It was one heckuva chase. Along the way we saved a missionary family that had been kidnapped by the smugglers, blew up a few things, got caught in a big flood and, as usual, we had to deal with all the nasty, hungry critters in the jungle. When the dust settled, Roberto had gone to meet up with his brother in that place where all the bad guys go when it’s their time. And Sanchez? Well, he’s still out there somewhere. He’d lost his nose and his ear the first time we met up with him, and now he’d lost one of his eyes. Something told me we’d be seeing him again.